Stocking fillers are one of those gifts which tend to get left to the last minute so I thought that it would be apt to dedicate today's post to some final ideas which I hope will help if you're panicking! Don't worry, they're still all under £10. 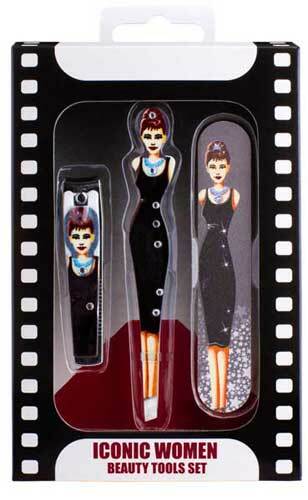 I sometimes wear false eyelashes when I go out and despite not normally liking 'sleb ranges, I really rate the Girls Aloud for Eylure range of falsies. Kimberley's design is my personal choice and, as I tend to use each pair just once, I'd be happy to find a pair in my Christmas stocking this year. 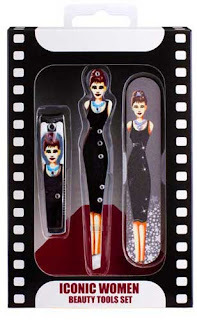 For film buffs, check out this handy Audrey Hepburn inspired accessories set which includes nail clippers, tweezers and a nail file. 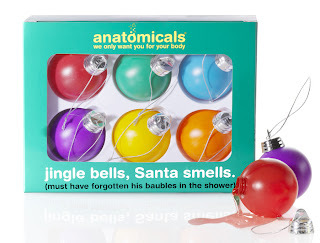 Fun brand Anatomicals have put a festive spin on showers with their Jingle Bells, Santa Smells Shower Gel Baubles.